U.S. 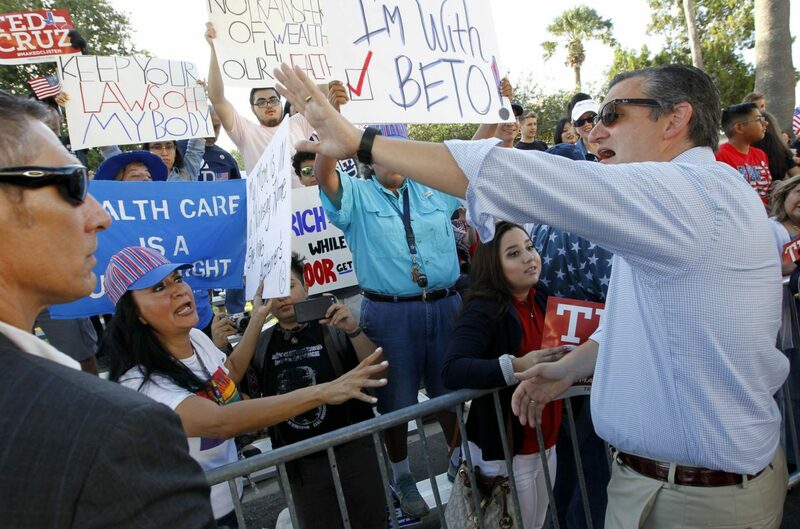 Senator Ted Cruz waves to people protesting him as Marsha Martinez, left, calls out to him to not cut health care benefits before the start of a patriotic program Tuesday at the City of McAllen's Independence Day Celebration in downtown McAllen. McALLEN — The free speech debate in the Texas Senate race has manifested in McAllen before, as Sen. Ted Cruz has repeatedly attacked his Democratic opponent, Beto O’Rourke, for his views on standing, or kneeling, for the national anthem. Cruz criticized O’Rourke, a U.S. congressman from El Paso, in an advertisement Wednesday, which is set to air in some Texas markets this evening during O’Rourke’s appearance on late-night comic Stephen Colbert’s show. The senator has attacked O’Rourke for his stance on NFL players kneeling during the national anthem. When asked at a town hall in August about NFL players kneeling during the anthem, O’Rourke gave a lengthy answer that included a history of civil protest, before concluding that there is “nothing more American” than to stand up or take a knee for one’s rights. Beto O'Rourke addresses the press and answers questions after seeing children and other family members detained by U.S. Customs and Border Patrol after illegally crossing into the United States during a press conference at the Hidalgo Memorial Park on Monday, June 11, 2018, in Hidalgo. McAllen Mayor Jim Darling is also a Vietnam veteran, flying 133 combat missions in 1969 and 1970, he said. Darling has not commented on the senate race but was interested in O’Rourke’s national anthem reasoning. 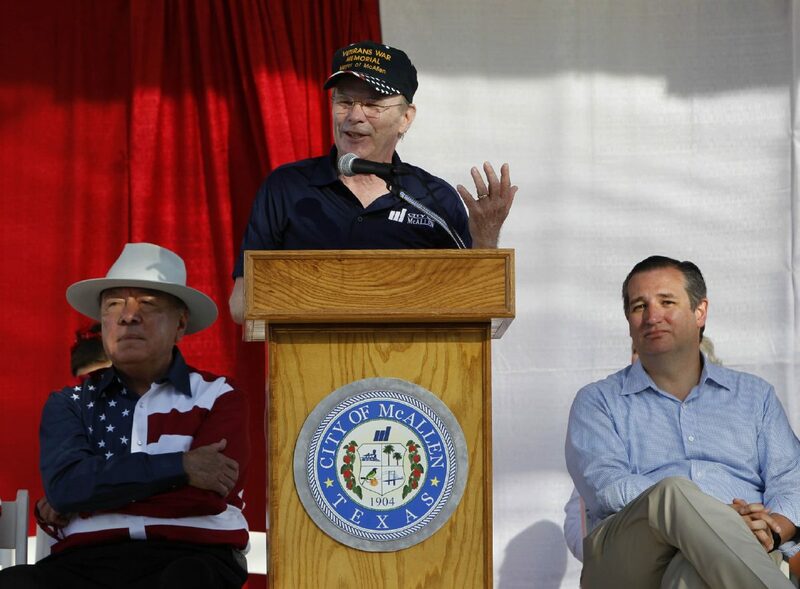 Darling hasn’t followed Cruz’s criticisms of O’Rourke’s explanation, but the mayor cited an event in McAllen last year which involved Cruz and free speech. The senator participated in the city’s annual Fourth of July parade in 2017. On stage with other politicians, Cruz spoke to a patriotic crowd, groups of which shouted at him in protest. Protesters continued to chant, before Cruz later concluded that they have the right to speak their mind. Darling said he appreciated the way Cruz handled that. “He could’ve taken it a lot of different ways, but he said, ‘It’s the Fourth of July; you’re expressing yourself. This is America; we’re free,’” Darling said. 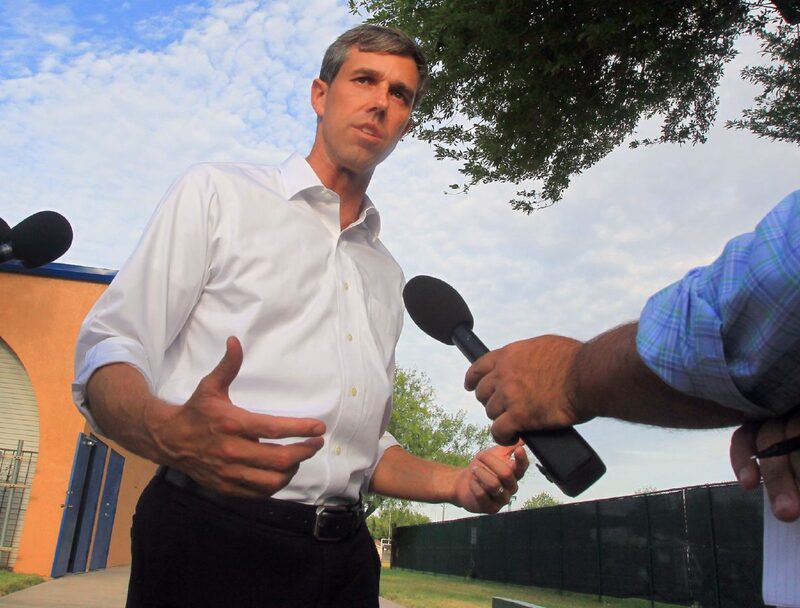 While Darling said he hasn’t seen Cruz’s criticisms of O’Rourke on free speech and the national anthem, he said O’Rourke’s explanation and Cruz’s Fourth of July in McAllen were both displays of how expressions of free speech should be addressed. “Those are two great examples of two guys on opposite sides of the political spectrum handling free speech how it should be handled,” Darling said.